This week we're interviewing a newer member to the SFR Brigade ranks, Lance S A Nielsen, who comes to authordom with a background in filmmaking. His debut novel released in early March 2018. I started out as a writer for the stage then, screenplays before turning my hand to novels. All my previous work had been serious drama or drama documentary. I have always loved Science Fiction as a genre in both books, television series and films. I really liked the romance in the film PASSENGERS and the way that was handled. In terms of being inspired, I actually wanted to write an epic story like GOT or LOTR but I also wanted it to be as relatable as possible to the average reader regardless of what genre they might be interested in. So that ruled out fantasy, it had to be set on earth and not too far from now, so those were my initial goal posts. Any good story will normally have a romantic element, so rather than deliberately setting out to write a romance novel, the romantic storylines came into place very organically, so I always knew romance would form part of the storyline for my series and in the first book there are two romantic narratives. When 200 alien objects, each the size of a city, arrive all over the earth, the world's population goes into panic. Yet once the ships land, there is no invasion, no communication, and no aliens nor any obvious access inside the vast vessels. As the governments and the scientific community struggle to find answers, a small number of ordinary individuals manage to gain access inside the ships. As speculation about the crafts possible intentions begins to seep into the public consciousness, those in power fear their presence may substantially change the social dynamics of the world as we know it. But do the ships represent a chance for the salvation of The Human Race or its annihilation? Diamonds in the Sky, Book One—Parousia, is set over the first few days of the alien arrival and told from a multi-view perspective of seven different characters, from a variety of different cultural backgrounds, spanning three continents across the world. Each chapter of the book is divided into three different character perspectives. 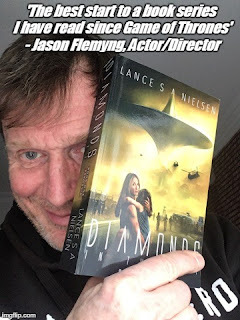 Actor Jason Flemyng with Diamonds in the Sky. 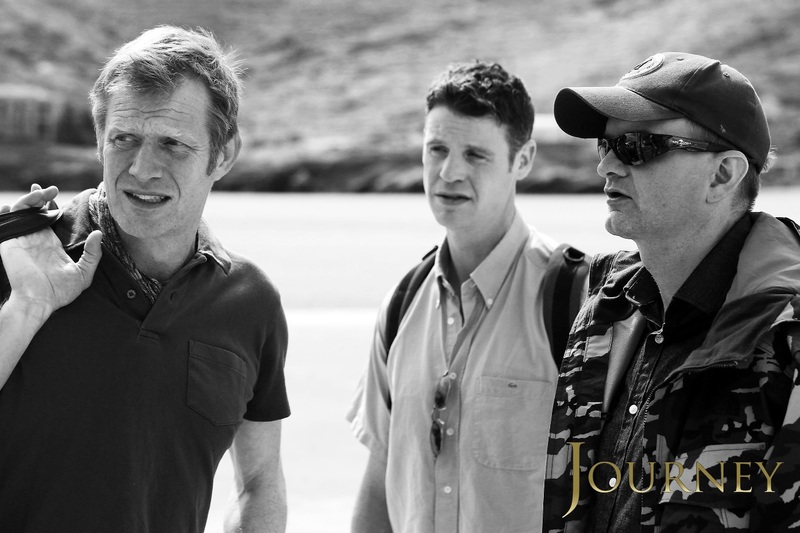 Image used with consent from Jason Flemyng. I decided the best way to get some endorsements was to send early versions of the manuscript to some high profile actors I knew in the film industry. Actor Jason Flemyng (IMDB) was the first to read an early completed manuscript and he gave me a great quote (pictured), then I had several other friends who were either writers or creative in another way give me several more. I had another extremely critical friend tell me the book was the best they had read since THE MARTIAN. They really gave me confidence in the story and the characters. I am not sure if this qualifies as special recognition but it’s certainly special for me. I have an office space in my apartment where I write screenplays and now my novels. It gets beautiful light in the morning which lasts until lunch time. I tend to do my story arc notes in my note book so they can literally be written anywhere. Often they come out of me on the London Underground, so I am furiously writing away my ideas on the tube (subway). Story is always king. The romance can be part of what’s at stake for the characters but it can’t be the only thing. I wanted to tackle quite a few social issues within my story and I knew what some of them were going to be before I started but they still had to work with the Science Fiction backdrop of 200 alien ships arriving on the earth. Hopefully it has all blended well together. What are your favorite SF/R movies or television series and why? Any favorite SF/R books? Recently television series have taken a huge jump forward in terms of plot, characterisation and the risks they’re prepared to take, it’s a golden age for TV drama which started with cop shows like THE SHIELD & THE WIRE that forced everyone to raise their game. I think THE SHIELD for example was one of the first long running shows to make every single leading character have something you both liked and hated about them in equal measure. Gone were the days where the cast were split between the good guys and the bad guys, which is great because real life isn’t like that either. Now the quality of television is so high and there is so much to choose from that I don’t have time to watch it all. Among my favourites are WESTWORD, GAME OF THRONES, BABYLON 5 & THE EXPANSE. Books wise I read a huge number of very different Science Fiction novels in my preparation for writing my own. I wasn’t looking to copy a style but wanted to set myself a really high standard to follow so I was keen to see how characterisation was handled and study the balance between description and dialogue that different writers used. Among the books I read were THE MARS TRILOGY (Kim Stanley Robinson) ALTERNATE CARBON, READY PLAYER ONE and EUROPE AT MIDNIGHT (Trilogy by Dave Robinson). I joined some time in 2017 while still writing my book and my contributions have been pretty minimal thus far. I will say I am a big believer in giving back what you get out of something so I have made sure I have followed loads of the regulars on twitter and even gave someone’s series a shout out on my Facebook timeline. and used with permission of Lance S A Nielsen. Lance Steen Anthony Nielsen resides in London, the United Kingdom. He was the resident playwright for the Jacksons Lane Theatre from 1997 until 2002 where his first play ‘Waiting for Hillsborough’ won him the Best Talent in New Writing, at the Liverpool Arts and Entertainment Awards. Following on from this much of his work began to focus on topics set within social and political arenas. His next play, ‘Sticks and Stones’, covered three families’ lives over four decades during the conflict in Northern Ireland and brought him much critical acclaim. ‘The Victoria Climbie Inquiry’ earned him Time Out magazine Critics Choice, while his play 'Making Time' won him a Peter Brook Empty Space Award. Additionally, he won a Peggy Ramsay award and has had plays produced at The Hackney Empire, Bridewell, Landor, Lion and Unicorn, The Mask. The Stratford Arts and Old Red Lion Theatres. He also wrote and directed the play about the inquiry into The Marchioness Disaster. His next play is about the making of the original The Magnificent Seven movie entitled ‘The Seven Young Guns of Hollywood’. He also directed two plays for Tom Hardy’s short-lived Shotgun Theatre Company, 'Two Storm Wood' and 'Blue on Blue'. In 2014 he wrote and directed the feature film 'The Journey' starring Jason Flemyng and Lindsey Coulson. It has won numerous awards at various Film Festivals Worldwide, including bagging one for Lance as Best Director at the International Film Makers Festival of Nice in 2015 and the Jury Award at the same festival in Milan. Currently in development is the film Pegasus Bridge, about the British operation to capture bridges by Glider Troops in Normandy 1944. Lance has spent a considerable portion of his time in Greece, a country which he credits for ‘Saving his life’ during an impromptu visit during a very dark period of his life in the summer of 2009. Thanks to Lance for joining us today to tell us a little more about himself, his background and his debut novel, Diamonds in the Sky -- Book One: Parousia. Wow this is great guys, thank you so much. I am humbled to be included with such other fine company. Very interesting! The book premise sounds fascinating. I started with plays, too, but didn't push forward with it. I think doing that helped my books though. Do you find the script/play writing helps feed the novel writing? Hi Pauline, thank you for the kinds words, as a baby to novel writing, I am most grateful. With this book, yes, definitely so. One of the main themes of the Diamonds series is the growing gap between rich and poor and how that is unsustainable. With my stage work I often tackled topics within the realms of the social divide and corporate responsibility with plays like the Marchioness Disaster and Waiting For Hillsborough, so these topics and themes very much overlap and I think seep into the writing with the novel. All of my characters are quite dysfunctional, which of course is what makes them relatable. 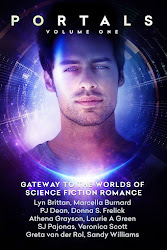 So I am hoping it will have a far broader appeal than just the Sci-Fi or romantic genre. Hi Pauline. I started with Plays and Screenplays, then moved into novel writing only recently. I think any type of creative writing helps feed off the other whatever it maybe but the most important thing for me is to get out there in the world and keep on meeting a wide range of different and eclectic people. What an interesting premise. I might have to take a look at that. Thank you so much Greta! Please do!